Taking an interest in Meret Oppenheim means studying a fascinating personality and a diverse oeuvre, which has lost nothing of its vitality and depth today. Everything that makes an impact in contemporary art - whether inter- or transdisciplinary approaches, or thematic variety and the freedom to select an individually suitable form and materiality as well as the optimal medium without adhering to any form of stylistic uniformity - has had its way paved by Oppenheim's work. The artist did not remain faithful to any one style or movement but was true to herself; she was bold enough always to address a new theme using a fresh pictorial language. Such intellectual flexibility and artistic self-determination appear exemplary, but this does not mean that she actually set out to be a role model. She was regarded as an inspiration to many women artists because of her own career and her publicly recognised emancipation from the historical movement of Surrealism, which was recounted in numerous interviews. Yet, by contrast, many reviewers perceived her and the "Fur Cup" either as a "one-day wonder" or merely as "Little Meret", a Surrealist muse. But this is a one-dimensional impression and, after numerous exhibitions, one that is impossible to uphold. Wider public perception and an increasing appreciation of Oppenheim's creative oeuvre developed in the late 1960s and 1970s. This international rediscovery was initiated by a retrospective in Stockholm's Moderna Museet in 1967, which was followed by a touring exhibition in 1974-75. The solo exhibitions provided impressive evidence of the work's wealth and force of renewal: its unity in diversity and constancy in change. In addition, the art of the 1970s made access to Meret Oppenheim's encoded art easier. According to Harald Szeemann, 1970s art was becoming increasingly content-oriented, so that in 1972 he was able to herald documenta 5 under the motto "Individual Mythologies". At that time Oppenheim was not invited to participate in the exhibition in Kassel, but in 1982 she was included in documenta 7 by Rudi Fuchs. Therefore Meret Oppenheim was one of the few female artists of her generation to experience international recognition during her lifetime. The city of Bern was only a limited source of creative inspiration. Oppenheim had kept a studio there since 1954 and she lived in the city from 1967 onwards. In the 1950s she had needed some time to find her way into the circle of Bern-based artists. There was some rich artistic stimulation in the 1960s thanks to the varied programme of exhibitions at the Kunsthalle organised by Harald Szeemann. This environment provided Oppenheim with many artistic stimuli and enabled her to explore international tendencies. Although there was exchange among the artists, Oppenheim's late oeuvre was noticed and taken seriously only on the periphery. Not a single work was sold, for example, at her first (and for some time only) solo exhibition in 1968 - a year after her retrospective in the Moderna Museet in Stockholm - in the Galerie Martin Krebs in Bern. Here, the old prejudices against female artists were obviously at work. Subsequently, in the 1970s when discussion of feminine art burgeoned, Meret Oppenheim participated with a keen mind and an extremely decisive attitude. She championed Carl Jung's ideal of androgynous creativity, whereby male and female aspects are both at work: she believed that these needed to be integrated by every person to the same extent, regardless of gender. Due to her consistently practised socio-critical and emancipatory attitude, she became a figure of feminist identification in the context of the women's movement, and a model for the younger generation of artists. 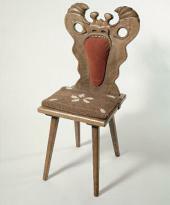 Meret Oppenheim's interests are clear from the topics she took up repeatedly in her works. She was concerned with the connections and boundaries between nature and culture, with the relations between the sexes, and with contradictions and comparisons between dream and reality. 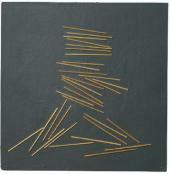 Her works are characterized by polarity, which she analyses or, wherever fitting, combines to create a new unity. In many texts Oppenheim's charisma and cultural-political significance as a public figure overshadow any investigation of her works. Regarding the outstanding features of her creative work, apart from those characteristics already mentioned, what stands out is her diversity of styles, which many interpreters link to her non-conformist personality. In her painting and drawing there are realistic figurative representations resembling "veristic Surrealism" and, parallel to them, organic abstractions. 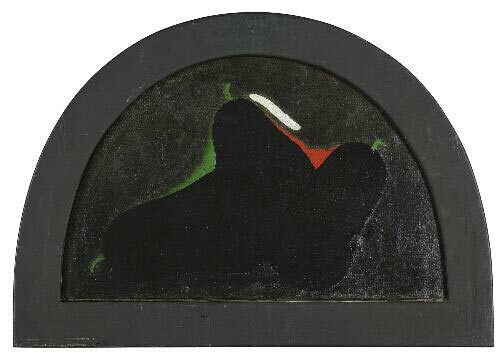 But there are also mixed forms, like the oil painting dating from 1934 titled "La nuit, son volume et ce qui lui est dan-gereux", or the mysterious lunette "Three Black Pears" (1935-36). In these early examples, one cannot be certain whether geometrical or organic bodies are being drawn realistically or whether one is seeing the poetic depiction of abstract themes. 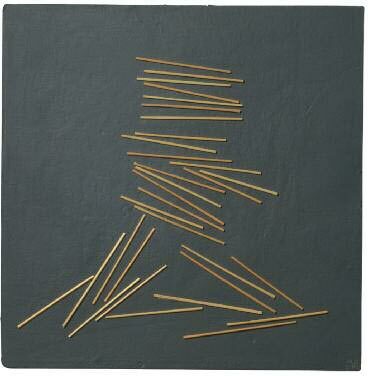 Besides these examples oscillating between figuration and abstraction, there are also material pictures such as "Building" (1935), the drawing of which was produced by sticking straw onto the surface. Generally, it may be said that free combinations of realistic-figurative painting style, material collage and geometrical-organic abstraction emerge increasingly in the later work, with an obvious reflection of Pop Art in the 1960s and 1970s. Viewed critically, one could also interpret the wealth of styles as an inability to develop a personal signature, or as artistic "uncertainty" and a relativising attitude. For Bice Curiger however, the author of the first monograph on Oppenheim, it is this very artistic openness that demonstrates the contemporary relevance of the work, especially as she sees it primarily as an insistence upon freedom of expression. 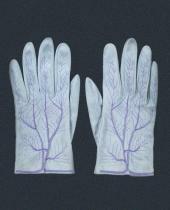 Thus as early as 1975, in conversation with Valie Export, Oppenheim stressed: "The idea appears in the garb of its form. "1 It remains open as to how Oppenheim senses this agreement between form and content; it is only clear that, in each case, she accepts the shape as being suitable and trusts in the correctness of her idea. She has free access to the full armoury of possibilities of visual expression and, to retain this, she accepts some simplicity of pictorial vocabulary as well as of composition. This simplicity is due to the certainty of the imagination of an image, which is based on the fact that Oppenheim reproduces inner images in a way as true as possible to their appearance in her mind. 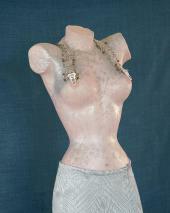 Her works are characterized by loyalty to her own visions rather than to notions of how art should look. Therefore we cannot read their artistic development from the works themselves. Surrealism expert Werner Spies sees the disconnection of Oppenheim's work from the movement as a separation from the sphere to which it ultimately owes its impact and significance. But why should the fame derived from the "Fur Cup" be dubious in any way? It is understandable that Oppenheim still felt too young after her creative crisis to be reduced solely to her pre-war production and the effect of her youthful body as seen in Man Ray's famous photographs, and this is important for the further development of her work. According to Spies, however, she remains "an important figure of the heroic period of Surrealism". 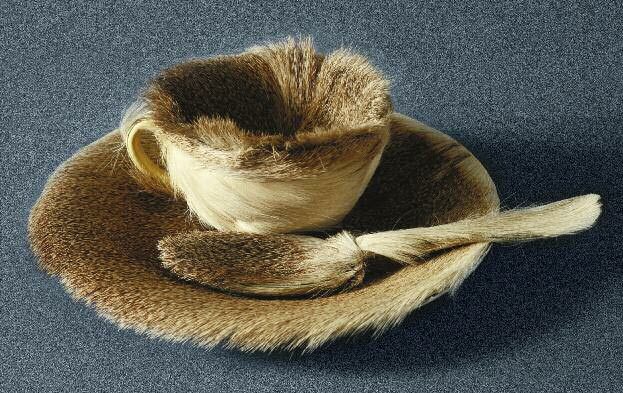 But the famous "Fur Cup", for Spies, is an impressive example of surrealist fetishism: the functional idea is torpedoed by its covering of fur, the useful value of the object is attacked, and the contemporary design of the cup is subjected to irony. Here, form does not follow function but questions it. The very style of Meret Oppenheim's objects with their unique deviations from original usage - resembling quirks of nature or rarities - concretizes the logic of cabinets of art and wonders. The objects "Gingerbread Monster Chair", "Box with Little Animals", "Gloves" with their red veins on the outer skin, or the embroidered and painted "Evening Dress with Bra-Strap Necklace" are precious rarities. Due to their meticulous decoration and crafted designs their effect is one of collector's objects in the sense of a cabinet of wonders. The way of thinking behind this nostalgic view betrays an interest in symbolic or magical ideas. In this, with reference to those cabinets customary in the Renaissance and the Baroque, there is a manifestation of doubt in man's belief in progress and rational explicability, which is celebrated by Surrealism. This effect, nurtured by the fantastic and the alienating, relies on a constant overcoming of expectations. 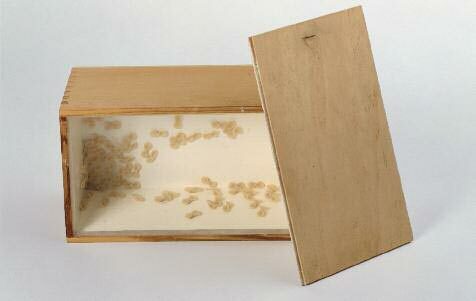 Like Marcel Duchamp with his contemporaneous ready-mades, Oppenheim's objects are overwhelmingly simple and - apart from the later editions - consist of unique works. Any series would have led to a style or "look", and would have undermined the wealth of associations they still arouse today. Entirely in the spirit of Surrealism, therefore, Meret Oppenheim represents an attack on the concept of usefulness, doubt in a belief in technical progress, and belief in freedom as a form of existence. She rebels against a bourgeois style of life - above all with respect to the classic understanding of female roles - and exhibits a fundamentally rebellious attitude. Outwardly, Oppenheim also retained links with the historic movement, as she participated in most international Surrealism exhibitions in the years 1933 to 1961, as well as publishing works in surrealist magazines and other publications. Despite the artist's statements of rejection, surrealist ideas remain the decisive precondition to Oppenheim's work. Thus the unmistakable nature of personal experience and artistic expression are among the passionately represented convictions in the work of Meret Oppenheim as well as in Surrealism. Surrealism also cultivated a pluralism of styles and did not lead to a binding stylistic means in itself. The central aims of the movement are rather spiritual in nature and, like Oppenheim's work, consist of an attitude rather than, for example, formal-artistic rules. Surrealist art is not a matter of transparent art, easily accessed by the intellect; Surrealism cultivated a tendency towards the enigmatic and the hermetic. Its representatives, like Oppenheim, defend themselves vehemently against any explanation or flattening of the irrationality that they conjure up. In an age of disappearing scientific certainties, when no single universal truth continues to dominate; in an age of shrinking security in the working world, in economics and politics, when the self-confidence of the individual is thus torpedoed even more, as shown by sociologist Richard Sennett in his study of "flexible human beings", once again the dream is becoming the sphere in which a counter world is designed, one in which society and reality must measure themselves against different concepts of the cosmos. In this interim sphere between the remains of the day and proclamations of desire, we can formulate such things as utopian or socio-critical ideas in addition to the customary, utilitarian principles that dominate our everyday world, just as the subconscious is dominated and eroded by the consumer industries. Letter interview with Valie Export, reprinted in: exhibition catalogue, Bern 2006, pp. 136-38. Helmut Heissenbuttel, 'Grosser Klappentext fur Meret Oppenheim' (1975), in: Bice Curiger, "Meret Oppenheim. Spuren durchstandener Freiheit", Zurich 2002 (2nd edition, 1982), p. 127. On this, see the multiplex analysis of the manifold forms of the androgynous in Oppenheim's life and work by Josef Helfenstein, 'Androgynitat als Bildthema und Personlichkeitsmodell. Zu einem Grundmotiv im Werk von Meret Oppenheim', in: "Meret Oppenheim. Legat an das Kunstmuseum Bern", ed. Josef Helfenstein, Kunstmuseum Bern 1987, pp. 13-30. Francois Grundbacher, 'Entretien avec Meret Oppenheim', in: "Beaux-Arts", No. 18, November 1984, p. 32. Walter Benjamin, 'Der Surrealismus. Die letzte Momentaufnahme der europaischen Intelligenz' (1929), in: "Angelus Novus, Ausgewahlte Schriften", vol. 2, Frankfurt a. M. 1988 (4th edition, 2011), p. 201. Durs Grunbein, 'Aus derTraum (Kartei)', in: "100 Notizen - 100 Gedanken, Nr. 65: Durs Grunbein", published on the occasion of documenta 13 in Kassel, Ostfildern 2012, p. 31. EDITION NO. 85/150. EDITION FOR PARKETT MAGAZINE 4 (1985).